In this fun audio excerpt get ready for a big adventure: a family of brave bear hunters trudges through muckle forests and skirlin snawstorms, claggie mud and a deep cauld river in search of a glowerin bear. When you’re not curling up on the sofa watching the highly anticipated Channel 4 TV adaptation this Christmas, take time to rediscover the classic picture book, now charmingly recreated in Scots for little adventurers. The original words and illustrations are transformed by language expert Susan Rennie into lively Scots for a bright and bonnie take on this favourite tale. Perfect for reading aloud with young children. 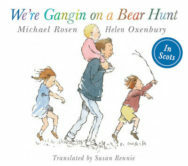 We’re Gangin On A Bear Hunt by Michael Rosen, translated by Susan Rennie, is out now published by Floris Books priced £6.99.